Come, Lets Party at Home! It is Christmas and New Year time and all the restaurants and food outlets may be overflowing with party lovers. So, how about hosting a party at home and making it fun? You could have the entire night and it could do some good on your wallet as well! Hosting a party at home is not a daunting task as it may appear. 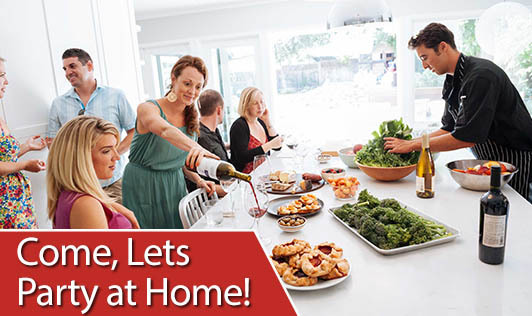 Here are a few tips to host a fun-filled, entertaining and a limited budget party at home. • Choose a day that is convenient for your guests and most importantly, a day when you have enough time to make pre-party preparations. • Plan the food menu, theme and events for the party in advance. Keep it simple! • Send out an invite and get a fair idea on the number of guests who will be joining you so that you can make the arrangements accordingly. • Go over your checklist once again on the day before your party to ensure you have everything taken care of. • Make sure you welcome each and every guest at the gate/door on your party night. They would love the gesture! • Break the ice by introducing them to each other and set the mood for the party. A dance party or some entertaining games are a few ideas to keep them occupied! • Try not to devote all your time to one particular guest, even if he/ she is very special to you. • Encourage your guests to sit wherever they desire and provide adequate seating for all your guests. • Music is a must!! Put on some music and pump it loud. No party is complete without good music. This will also keep the guests distracted and bring life to a quiet atmosphere. • Be a wise planner; Make sure you do most of it on your own so you are sure of all the details. Take help whenever you can. • If you decide to prepare your own food, start early to make sure you're set by the time the party begins. • Allow enough time for the guests to arrive before serving a meal. Buffet style can make everyone feel at ease and encourage socializing. • Keep the beverages area separate. • Count your serving plates and glasses to make sure there are enough for everyone. Go for disposable tableware to lessen your work of cleaning the dishes after the party. • Include a few healthy food options in the menu. Cook something different so that it could become a topic for discussion. • Always make sure there is ample food for everyone. Fruit platters will usually do the trick. • Don't pressurize yourself. Even if it is not perfect, no one will mind. Remember, if you are having a good time at the party, others will definitely have one too. Smiling is the key and it will take you a long way to becoming a good host. Smile, dance, eat and be merry! Host and enjoy a fun-filled party!